This is Medium.js. 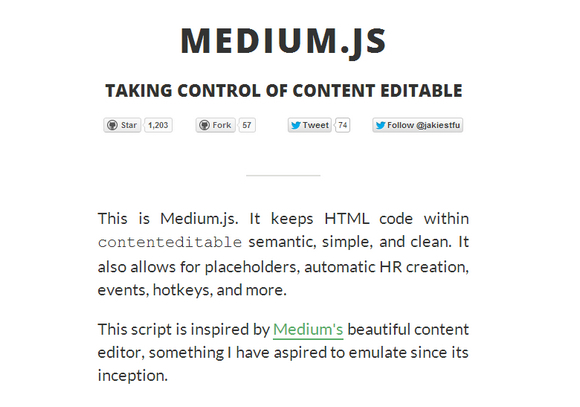 It keeps HTML code within contenteditable semantic, simple, and clean. It also allows for placeholders, automatic HR creation, events, hotkeys, and more. It is Library Independent. It supports Rich text editing with hotkeys (cmd/ctrl+[,b,u,i]). You can use it for Inline editors, partial editors, and rich editors. It is great for writing articles, comments, or titles. Great to use instead of input. Medium.js has been tested in Firefox 17+ (No Placeholders), Safari 5+, IE 10+, and Opera 11+ (No placeholders and no hotkeys).